The end of the world a.k.a Armageddon is finally scheduled. The evil against the good, global cataclysms, wars, famine, the Moon looking like blood and so on. In order to do it right the son of Satan has to be born and brought up among humans. 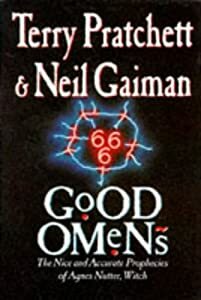 A demon called Anthony Crowley, working more closely than he should with an angel called Aziraphale, is supposed to ensure the boy goes to the right, influential American family ( a kind of parody of a very old thriller “The Omen”). Things get tangled up because of his clumsiness, one chattering nun, an ordinary Englishman expecting his first newborn baby and a bunch of other strange events. While both Heaven and Hell are in a race to make sure he does what THEY want the devil’s spawn ends up being named Adam (not Damien or Warlock or anything evil) and happens to be raised in a provincial British town by ordinary lower middle class people. It is not exactly something good for his devilishness or the plans of the mighty forces above and below. Even his hell hound turns into an innocuous mongrel who loves chasing cats. The four riders of Apocalypse have obtained their orders though and are determined to carry them out. What will happen to all these people? Will anybody be able to locate the boy and start the end of the world properly? Perhaps a witch or two will come in handy; them and some witchfinders, their natural enemies…and an unusual book with deadly precise prophecies, written by the late Agnes Nutter. The book should be entitled “Plethora of Chuckles”. It was a scream from begining to the end, as fast-paced as you would like, and the characters were surprisingly well-rounded for such a light read. Crowley was presented as an intensely cool character, neither completely bad nor completely good. He has realized a couple centuries ago that human beings faced with enough daily aggravations could condemn themselves so he takes it easy now. Aziraphale, an angel and part-time rare book dealer, was his perfect partner in good and bad deeds. I was even more impressed with the way Gaiman/Pratchett handled religion, a very delicate issue. They got their laughs without slipping into mockery or trying to disprove anything. It’s all to easy for a non-religious author to take the side of hell. That doesn’t happen here. Also an in-depth insight into religious matters is not needed to enjoy the book; all you need is a sense of humor, a knowledge of the most basic points of Christian theology/culture and the basic knowledge of Queen songs, the favourite pop band of Crowley. The romance between the younger witch, Anathema, and poor young Newt, the witch-finder private, was a bit boring and superficial compared to the rest of the book but believe me it is really a minor quibble. Without a doubt, one of the funniest books that I have ever read – I strongly recommend it! The best summary I could find – enjoy! This entry was posted in book review, fantasy and tagged collaboration, Neil Gaiman, Terry Pratchett. Bookmark the permalink. This is a great review. I will definitely have to check this one out. I'm glad you enjoyed it, anachronist. I agree with you about the romance, but hey, there always has to be one in every novel – it's traditional. I loved the Hellhound.And I thought it did make a few serious points too, especially that horseperson of the Apocalypse, Famine – very, very true. Also Pollution replacing Pestilence as one of the horsepeople. But then, not so much, I kind of grew out of humour fantasy 😦 Blodeuedd, I think humour works best because/when it is novel – a new perspective. Once you get used to a style of humour, it becomes predictable, and so no longer very funny, no matter what kind of humour it is. There has to be something more than just humour to really make you want to read them, I think most of Pratchett's books work because they do have a fundamental truth to them. Thanks for all the comments – you rock!Bloodeuedd I can only add that in this book the sense of humour is not typically Terry Pratchett's and yes, there are some fundamental truths explored so when you stop laughing you don't feel it was only an empty, meaningless joke.I thought it did make a few serious points too, especially that horseperson of the Apocalypse, Famine – very, very true.I agree here – the four horsepersons were absolutely spot-on but Famine (Raven) was the best of them.